Can I filter individual tracks from Shopify collections? How is digital music added to my Shopify store? How will releases display in my store? What is a Shopify collection..? Shopify allows you to automatically filter products into different categories based on tags, name or product type. This can be a powerful tool, especially when dealing with large Shopify stores. Shopify collections offer a unique way to display groups of items to customers. For example, you can create a “music” tag. All of the music in your Shopify store can be displayed in a collection, so your fans can find it all in one place. Follow these links for instructions from the Shopify Help Center. When publishing a standalone album to your store, Single will create one product for the entire release and an additional product for each digital track. This is required to make your tracklist a purchasable list of songs. 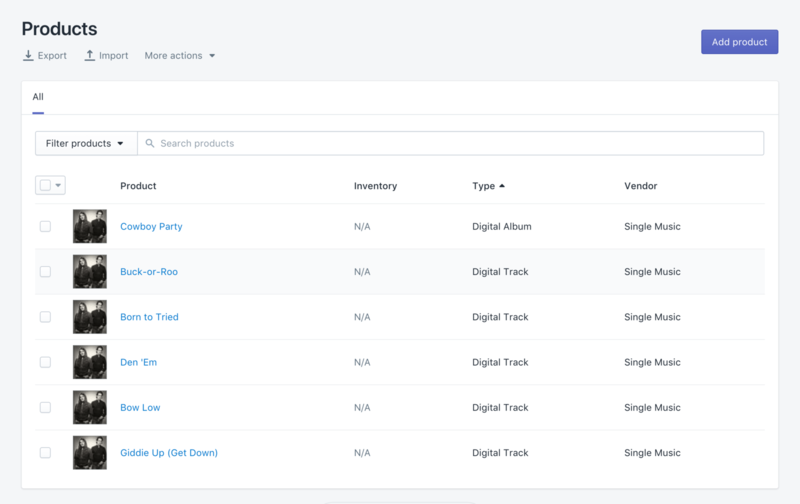 Every digital track product created by Single is given the product type of “Digital Track”, and albums are given the product type “Digital Album”. For information about how music is sent to Shopify from Single, try this article. You can see how the products look in your Shopify Admin in the image below. What if you want to filter your collections further..? Enter Shopify conditions. These are customizable rules that you can set for your Shopify collections. The image below shows our first example - creating a collection for every product with a “music” tag. But what if you only want to display full albums in this collection? 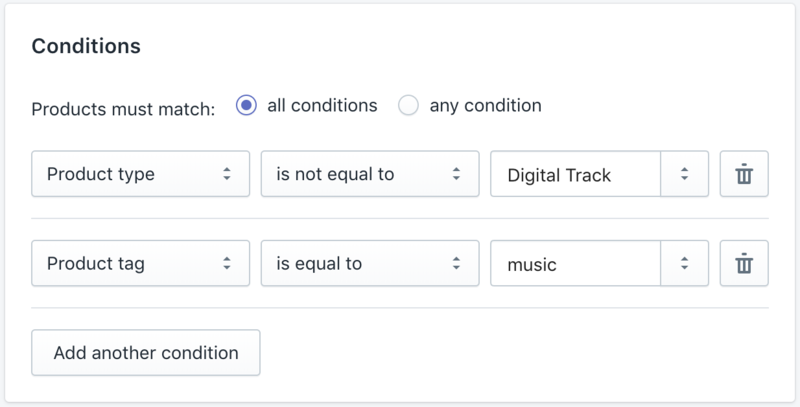 Simply add another condition to exclude all of your digital tracks. Just make sure you select the box that requires all conditions are met. Create separate collections for anything from CD’s, Vinyl, Digital Downloads or Merch bundles. Even better, create collections based on conditions that are specific to you and your music. Notice anything we left out? Talk to us!